The DC Breeze logo for almost five months died Wednesday of branding-related causes, the team announced. The patriotic-colored logo for American Ultimate Disc League's professional team in Washington, DC was known as a laid-back emblem destined to be imprinted on merchandise. The team said that there would be no logo at the upcoming Saturday tryout, but that a moment of silence will be observed long before anyone arrives to the field. "We are all in a state - no, a territory - of shock," one DC fan said. "We had no warning whatsoever." 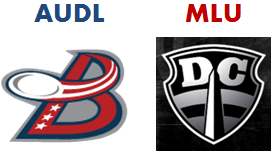 The 2013 expansion AUDL team already unveiled a newly designed logo – a "B" – which can be seen on the Breeze website and their social media sites. After last Saturday's tryouts for the two DC professional Ultimate teams, another round is scheduled. Players are being evaluated to be placed on the roster in time for their opening games on April 20, 2013. Details Be prepared for a snowy field. Be prepared for interviews. 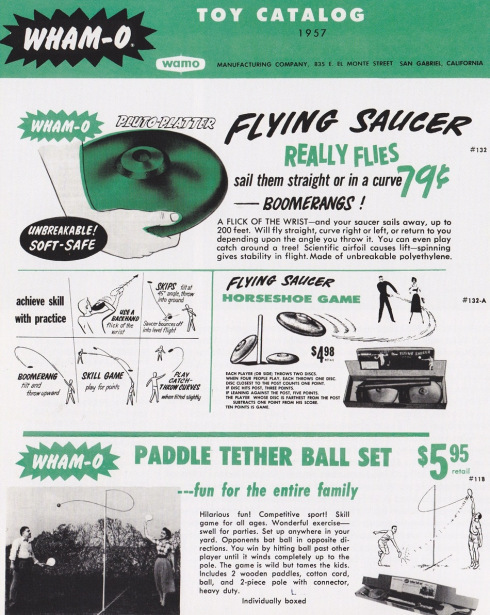 Without the existence of Ultimate yet, this 1957 WHAM-O ad offers ideas to potential customers on what to do with a "flying Saucer" Pluto Platter (Frisbees). 79 cents for the "unbreakable polyethylene." Per inflation, what cost $0.79 in 1957 would cost $6.22 in 2011. 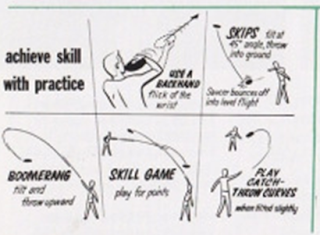 Great line: "You can even play catch around a tree!" TRY A BACKHAND flick of the wrist. SKIPS tilt at 45* angle into ground. Saucer bounces off into level flight. 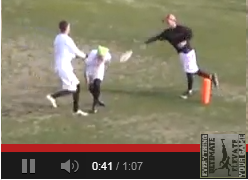 BOOMERANG tilt and throw upward. SKILL GAME play for points. Play CATCH-THROW CURVES when tilted slightly. RELATED: Other vintage WHAM-O ads. An incident at a recent Alabama vs Central Florida Ultimate game has raised the question of repercussions for unsafe play. The video titled "Alabama Player Spikes Disc On Opponent" also shows the UCF defender making a needless bid making contact with the scorer. USAU's Spirit of the Game cites "...Such actions as taunting opposing players, dangerous aggression, belligerent intimidation, intentional infractions, or other 'win-at-all-costs' behavior are contrary to the Spirit of the Game and must be avoided by all players." 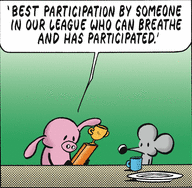 Or, read MLU's Spirit of Sportsmanship or AUDL's Integrity Rule. Ultimate Leagues usually have players sign-off on a waiver stipulating "I have read and understand the policy." 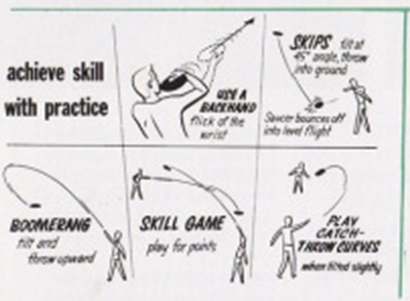 As an example, here's Washington Area Flying Disc Club's Conduct Policy for players. WAFC members are expected to behave in a manner consistent with the ideals and vision of the organization. A member's responsibility to this charge manifests itself on the playing field, in his or her interactions with the administration and officers of WAFC, and in his or her dealings with the greater ultimate community. The same expectations are made of teams and other groupings of players. "On-Field Conduct" refers to the actions of players and teams during the course of a tournament or other WAFC event, and is not limited to actions during a game. Players and teams are expected to treat one another with respect, to conduct themselves in a safe and orderly manner, and while playing to adhere to the rules of ultimate as well as to any tournament and site regulations. Violations of conduct occur upon the breach of these expectations. On-field violations may therefore include (with the clause being violated appearing in parentheses), but are not limited to, abusive heckling (respect), spiking the disc on another player (respect, safety), dangerous play (safety), spitting at another player (respect), cheating (rules), deliberate fouling (rules), reckless behavior at a tournament party (order, safety), drinking on the sidelines when prohibited (site regulations), taunting (respect), creating a hostile environment (respect, order) and violence against another player (respect, order, safety). Repeated, excessive or deliberate inappropriate conduct constitutes a violation of this conduct policy. An individual instance of inappropriate conduct may also warrant sanctioning by the Board if the action is severe enough. Players are expected to act consistently with the mission of WAFC to promote the sport of ultimate. Actions inimical to the sport of ultimate are violations of conduct. Such violations may include, but are not limited to, libel against ultimate players or organizers in the printed media, obscene acts on televised media featuring ultimate, and vandalism or other destructive behavior, including playing on closed fields, toward an ultimate facility. The Board is not limited in its range of sanctions, except by the requirement that the penalty be proportionate with the severity of the action or its consequences. Such sanctions may include, but are not limited to, public or private censure, demand of public or private apology, demand of completion of service to the ultimate community, probation, and suspension from participation in WAFC events. Suspensions or penalties occurring for a duration of time longer than one (1) year will be reviewed annually by the Board. 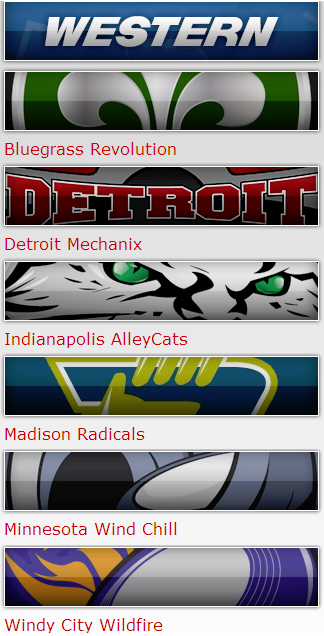 Definitely not AS MUCH drama as the Eastern Division, but changes, nonetheless. The Bluegrass Revolution moved intrastate from Louisville ("River City") last year to Lexington. This year, BGR's interstate movement is to Cincinnati, Ohio - the previous home state of the defunct Columbus Cranes. It's been a few days since you had a positive showing at the professional ultimate tryout or combine. Congratulations! You may not quite believe the magnitude of your experience. You can't get it off your mind. For those who are lucky enough to be offered an ultimate playing contract, it may feel like your whole life has changed. You know you have to tell your parents. But you may not be sure you're prepared for how they might react. If you've just learned you're going to play ultimate professionally, you're not alone. With twenty total teams in the two professional ultimate leagues – AUDL and MLU – there are many talented ultimate players who are being signed. You might feel confused, scared, or shocked by the news. You might think, "This can't really be happening." And you know you'll probably have to tell your parents. No matter how close you are to your parents, you're going to wonder how they'll react. 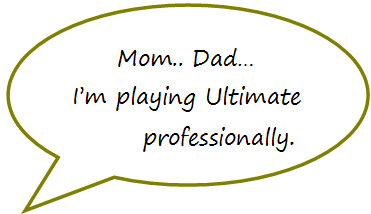 It's one thing if your parents realize you're playing ultimate and they're OK with that. But it's another thing if they've expected you to get a real job. Even parents who know their sons are playing ultimate can still be disappointed or worried about their future. First, find the words. You might say, "I have something difficult to tell you. I found out that I'm playing ultimate professionally." Then wait. Allow your parents to absorb what you said. Be prepared to deal with the reaction. What happens next? Will your parents be angry, stressed, or emotional? Will they lecture you? Use harsh words? Ask a ton of questions? Of course, not every parent yells. Many don't. Even if parents have a strong reaction at first, most want to help their children. Lots of ulti players are surprised at how supportive their parents turn out to be. Share your fears and worries, such as, "I'm scared about how I'm going to handle this, what my friends will think, and what it means about school or gainful employment." Or, "I can't believe this is happening to me and I'm not sure what to do." Now that you've told your parents, you'll have some important decisions to make. Talking decisions over with others can help. Sometimes other ultimate players – even from other cities – offer a new angle or ideas. Whatever you decide, it needs to be what you want, not what someone else wants you to do. That's especially true if you think most of the financial support for playing pro ultimate will fall to you. Becoming a pro ultimate player affects your education, job, and financial future. It's a big job. The DC Breeze spoke to sports-radio station WJFK-FM yesterday. On Friday, January 25, TJ from DCB spoke for about 10 minutes on The LaVar Arrington Show with Chad Dukes airing on 106.7 in Washington, DC. Chad Dukes, who plays in a local pickup game, is a known friend of Ultimate Frisbee. 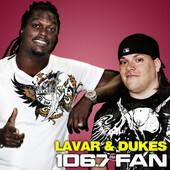 LaVar Arrington, a former NFL player, is a local celeb. Dukes introduces the segment with "Joining us on the...hotline; hottest new team in the area, Vice-President of Community Affairs for the DC Breeze of the American Ultimate Disc League." LaVar: "I think this is awesome." Dukes starts off with: "Now you guys are a professional Ultimate team, right? This is not a collegiate, or some sort of commune type of deal that we've seen on the movie PCU. You are in a legit professional league, yes?" LaVar: Wow...So, people come from all over the land to toss frisbees against one another. TJ: Oh, that's been the case for a long time, LaVar. Dukes: C'mon LaVar. Get with it. LaVar has been poo-poo'ing my Ultimate career the whole time, TJ. LaVar: I am being enlightened right now...So, what does a base salary go for? TJ: ...Well, that depends on the player. For you, maybe, something around 10 g's ($10,000). Dukes: What about a 'Chad Dukes'? TJ: A 'Chad Dukes'? Well, we were talking about a 15-minute contract for Chad Dukes. TJ: There's issues with your fitness that you were telling me earlier. Dukes: Well, my cardiovascular is not...I watched your highlight video on your website & it looks like a lot of your guys can move up and down the field fairly quickly. Discussion leads to "the guy...from Florida" Brodie Smith. Dukes asks "He's not in your league, is he?" The show's producer, Robert Bode, adds: "I want to catch a Frisbee jumping out of a boat from Brodie Smith." Dukes: "You're a big dummy." Dukes: Bode, try not to fan boy out for other team's players when you're talking to one of the guy's from our local team. Duke: Oh snap!! I like it! They also talk more about salary, athleticism, and the Breeze's open tryouts. LISTEN to the PODCAST [Segment 17 on Jan 25]. 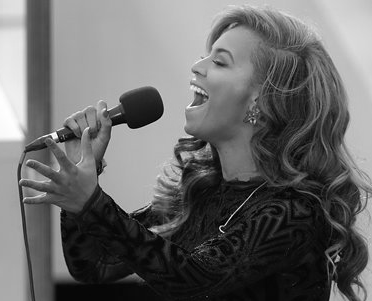 In the wake of Beyoncé lip-syncing the national anthem at the 2013's inauguration ceremony for President Obama, Ultimate Frisbee players are now coming forward with their own lip-sync stories. Miming along to a team's 'Spirit Cheer' is not unheard after an Ultimate game. The Spirit Cheer is a demonstration of Spirit of the Game where teams cheer their opponent at the end of the game. Cheers, or "calls" in the UK, are often creative songs. At the 2009 Chesapeake Open, a barely rehearsed post-game 'Spirit Cheer' was loudly chanted to Axis of C'ville. Players who knew the cheer positioned themselves near the front while one player stood in the back directly behind the team's tallest player. A USAU Observer observed, "After three lines of this live performance, players from the other team began to question whether everyone was truly singing." The identified player commented, "I felt rushed in trying to memorize four lines of rhyme scheme." He added, "I do recall announcing 'Prepare to receive!' as my contribution." "He wasn't comfortable performing without a rehearsal," Ultimate teammates remarked. "We always knew that lip sync was a possibility." After the tournament, a white board was procured to help reduce future lip syncing of Spirit Cheers. Tryouts for the two DC professional Ultimate teams are scheduled for the same day (Saturday, January 26) about 30 miles apart. The evaluation of players are meant to field a team in time for their opening games on April 20, 2013.
forced a new venue. Cleats are not allowed. Initial Thought Bundle up! Wake up! The date and location for the 8th annual SLUDGEY awards has been announced! Skyd magazine recently published their preseason Top-20 of Men's College Ultimate teams with an excellent data table. The top 5 teams are: Pitt En Sabah Nur (1st); Carleton CUT (2nd); Oregon Ego (3rd); Wisconsin Hodags (4th); Central Florida Dogs of War (5th). Out of the 10 USAU regions, only Metro East is not represented. North Central region leads with 4 teams with the remaining regions each represented by 2 teams. Two of the 4 North Central region teams are ranked in the Top-5. 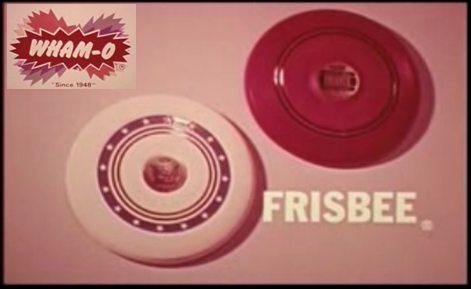 Happy 56th Birthday, Frisbee! Thank you for being the disc of choice for Ultimate players (up until 1991). On this day in history, WHAM-O recounts... A building inspector named Fred Morrison puttered with and refined a plastic flying disc that he sold to WHAM-O®. Introduced to the consumer market in 1957 as the Pluto Platter™ (the name inspired by the country's obsession with Unidentified Flying Objects), it was modified in 1958, renamed the FRISBEE® disc, and has become an American icon. Is the Major League Ultimate season a preseason for elite Club Ultimate teams? The east & west coast cities chosen for MLU's inaugural professional season are in "strong markets," and align with perennial elite Club teams. 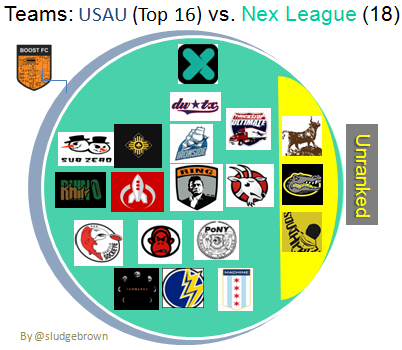 All 8 teams, except one (Philadelphia Southpaw), have a club team ranked in USAU's Top-16 (Pro & Elite flights). The MLU announced their pro season scheduling so players could "move into the club season" and expressed how the MLU sched "makes that work for them". The breakdown is MLU's season starts on Saturday, April 20, and ends the 3rd week of June (22-23); playoffs on June 29-30, and then the championship game on the "second weekend of July" (July 13-14). 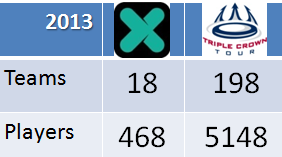 So, the MLU's season seems to sync around the planned USA Ultimate's Triple Crown Tour. Where the U.S. Open Ultimate Championships begins in [the first weekend of] July which serves as the first of several Pro Flight events on the TCT. 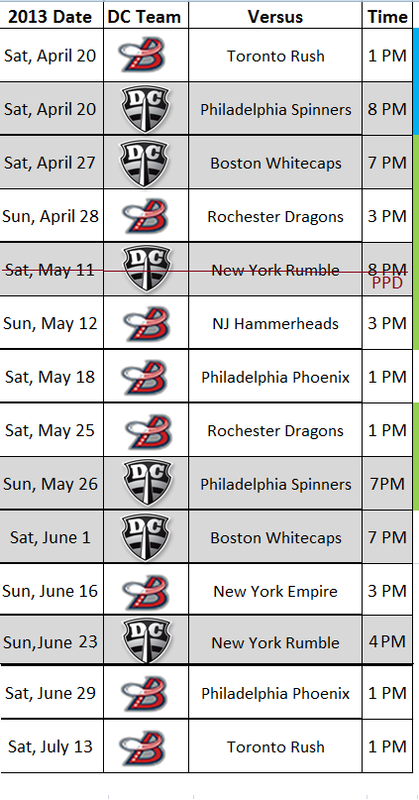 The AUDL's 2013 season schedule runs longer with regular season games through July 12, plus the yet-to-be-scheduled 2013 Conference Finals and Championship Game. Just like on NBC (Fallon, Leno) & TBS (Conan), Ultimate makes it on late night television. The Late Late Show on CBS featured an impromptu interview of two Ultimate players from Philadelphia who were in southern California for the Lei-Out Beach Tournament. 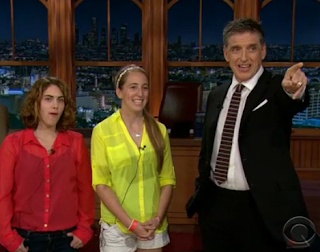 This January 17th episode (Season 9; Episode 1649) starts with Craig Ferguson interviewing 2 females from Philadelphia. See below for the transcription of their conversation. Craig: What are you doing in L.A.? ANSWER: We're out here for an Ultimate Frisbee tournament in Santa Monica. CF: Really?! This Ultimate Frisbee tournament of which you speak. Can anyone take part? CF: For example, my dogs? CF: Really? What do you do in Ultimate Frisbee? What's the difference between Ultimate Frisbee and just "Frisbee"? A: It's way more intense. You throw the Frisbee and you have to score in the other endzone. A: Except, way more fun. CF: Is it way more fun? How do you get your way into Ultimate Frisbee? (laughter) do you start into Frisbee and then just work..Frisbee is the gateway thing to Ultimate Frisbee? Ultimate Frisbee is the crystal meth of Frisbee. (laughter) Are you a team? Is that what it is? CF: You're a team. So, you play in…doubles? A: There's 7 on your team, at a time. A: There's more. But 7 on the field at a time. CF: There are VAST TRACTS of the world I know nothing about! (laughter) I thought Frisbee was just a thing stoners did in the park. A: That could be true. That has not gone away. CF: Well, how you guys doing? Have you started yet? CF: I know what a "weekend" is. CF: Well, we've got a treat. How many people are on your entire Frisbee team? CF: Fifteen?! Well those fifteen people will be going to a restaurant… at the expense of the great CBS Corporation! In a panic, due to the Subway 11-inch foot long crisis, I took a tape measure to every single of my Frisbees. After 50+ measurements, I am happy to report all DISCRAFT Ultimate discs measured to be the very same size - 10.75 inches; about the same size as a Subway footlong (11"). 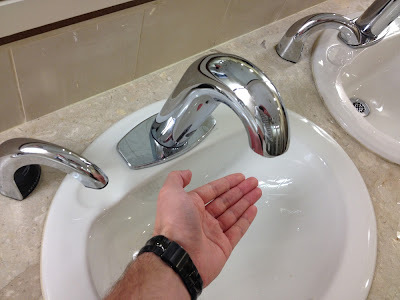 Darn you automatic sink faucet! I am open!! Why oh why can't you see me, sensor?! 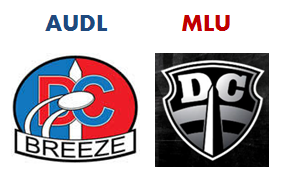 As previously hinted at the DC Breeze's introductory meeting in December, DC's AUDL pro Ultimate team announced many updates in their 'insider mailing list' sent on Wednesday, January 16. "The DC Breeze will soon be formally announcing an official apparel sponsorship with the [inter]national sporting goods giant, Reebok." "Final stages of securing a sponsorship with Reebok. They reached out to us (DC Breeze). We (the DC Breeze) will be the first AUDL team with a major sponsor." The DC Breeze provided a necessary correction to me by email & finally on their blog to their initial release about "Reebok sponsorship". This update is meant to correct what was previously directly announced by the DC Breeze. The DC Breeze is in a licensing agreement with Interscholastic Licensing Corporation (ILC) who is a sole wholesaler in partnership with Team Reebok. The DC Breeze benefits from this relationship with ILC/Team Reebok through merchandising which allows us to bear the Reebok logo. The DC Breeze and the AUDL want to be clear on their position as it pertains to any and all sponsorships, partnerships whether they are on the national or local level. 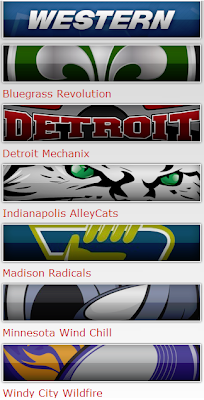 Madison Radicals is one of the new AUDL teams this season in the Western Midwest Conference. 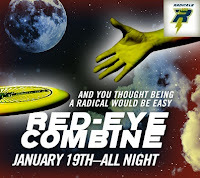 Due to limited indoor space and weather constraints in Wisconsin, the Radicals are hosting a red-eye combine on Saturday, January 19th from 11pm to Sunday, January 20, 5am. Registration details here ($25), including "unlimited Monster Energy provided + Radicals disc." 10) You snooze, you lose. 9) An Ultimate disc makes for an okay pillow, but a horrible blanket. 8) No-way, no-how anyone's gonna be late to this Ultimate game. 7) I stayed up all night for a pro Ultimate team tryout & all I got was this disc. 6) OMG! Wherever did you get those Hodags pajamas? 5) Go big, or go home AND SLEEP! 4) Layouts make for a choice opportunity for a mini nap. 3) Throw to me! I'm awake. Your turn! What else do you predict will be overheard during this midnight tryout? USA Ultimate's Board of Directors released this statement which proudly "reaffirmed their commitment to advancing the sport of Ultimate in the U.S., the Triple Crown Tour (TCT) and the athletes and teams that choose to compete in the TCT." We are very proud of both the history and evolution of our sport and USA Ultimate over the past 30+ years... USA Ultimate remains fully committed to not only listening to our athletes and teams, but to creating structural changes in our organization to mature and change along with the evolution of our sport. We also remain fully committed to our goal of increasing the visibility of Ultimate, and believe that USA Ultimate is the organization that is best positioned to partner with both national sports broadcasters and endemic digital content providers. We are committed to doing our best for all of our members and constituents including the athletes and teams, coaches, observers, alumni, league organizers, tournament directors, volunteers, parents, college and university club sports departments, business partners and sponsors, as well as our international community and WFDF. The board of directors reaffirmed its commitment to the Triple Crown Tour. The TCT is a creative and inclusive approach to Club division restructuring, which simultaneously allows for a high degree of media visibility for our premier divisions. While we recognize and respect that implementation of a "regular season" may present initial challenges for some, we are confident that the new structure provides a dynamic and fun experience for all the teams and athletes. Furthermore, we believe the promotion/relegation process of the TCT will create not only interest, excitement, and opportunity, but also add some drama to each season. Based on recent discussions with team representatives, we have already made important adjustments for 2013, including a reduction in the number of required tournaments for the pro flight teams from three to two. We remain committed to implementing future adjustments and modifications to the TCT in 2014 and beyond in order to strike the right balance between giving teams a great experience and growing the sport by achieving the number one goal in our new strategic plan: increasing the visibility of Ultimate. Effective immediately, we will create new committee structures to ensure that our top athletes and teams have an opportunity to provide direct feedback and advice into the TCT and its elements. We want to assure the athletes and teams that they will have continual input into decisions regarding the TCT. As part of an ongoing process, we are also restructuring the composition of our board over the next two years to reserve seats for elite athletes, to be elected by fellow elite athletes. We recognize that many of these athletes have made tremendous commitments and sacrifices over the course of many years to their teams, communities and the sport of Ultimate, and we want them sitting at the table with us, giving a voice and representation to their peers for important decisions about the sport. As Dan Saipher already observed (comment posted via Fb), a very small percentage of USAU's membership is being focused on. Now, the TCT is legitimately based on USAU's strategic management effort - a blueprint for an organization's goals and objectives; a plan that was developed directly from members' feedback and input. In this case, it does appear that the stronge$t voices (Elite club men's teams) have had their voices heard. Overall, the Top-16 club teams from each of the 3 divisions represent about 416 players (1,248 total; 3.6%). Most likely, players who are "Adult" or "College" members compose the "Top-16 Club" subset. Also, the yet-to-be-USAU-defined "elite" is assumed to be the top 16 teams across the men, women & mixed club divisions. For all USAU membership categories (Staff, Lifetime, Adult, College, Youth, Coach/Player, Coach, Friend & Family), go to their stats page. With both leagues releasing their 2013 schedules, Ultimate fans in Washington, DC - one of 3 cities with 2 teams - can start planning which games to attend. There are a total of 13 scheduled DC home games; 8 for DC Breeze (American Ultimate Disc League) + 5 for DC Current (Major League Ultimate). There are 4 times where both teams play on the same weekend; once on the very same day - April 20, 2013. Should be a very interesting opening day (4/20) for DC Ultimate fans! 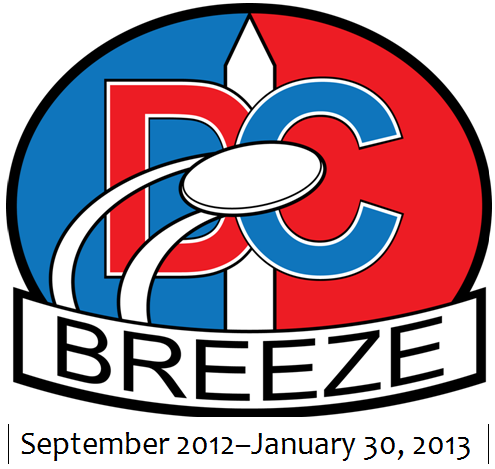 Game locations: DC Breeze will play at Anacostia High School (1601 16th St, SE). Buy tix. DC Current - Montgomery Blair High School (51 University Blvd E, Silver Spring, MD) Buy tix. 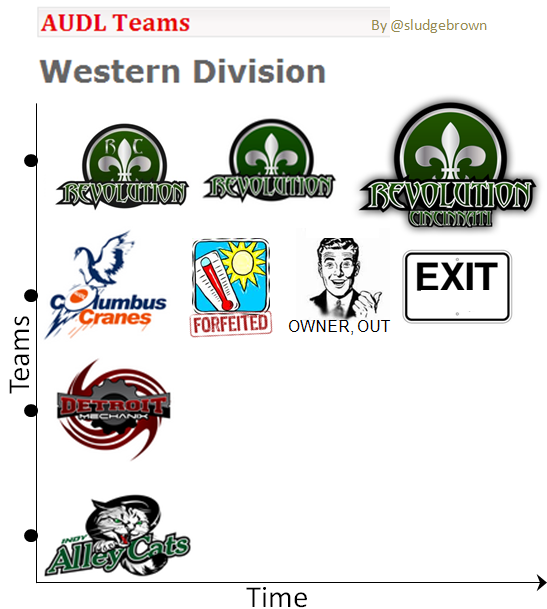 The six pro Ultimate teams that compose AUDL's "Western" Conference are located in Kentucky Ohio, Michigan, Indiana, Wisconsin, Minnesota, and Illinois. More specifically, Lexington Cincinnati, Detroit, Indianapolis, Madison, Minneapolis and Chicago. The last time these locales were considered "western" was 1803, before the Louisiana Purchase. Interestingly, the most recent AUDL announcement about player prize money referred to a renamed conference, when they said "The winning teams in the Eastern and Midwest Conferences will each win $5,000..."
Seems like only a matter of time (2014) a Western Conference will be formed (if AUDL's expansion plan is to be trusted), so best to give the 6 centrally-located teams a more geographically correct conference name right now. MLU quietly announced two teams - New Jersey Founders & San Jose Black Hats - would be disinvited to their inaugural 2013 season. 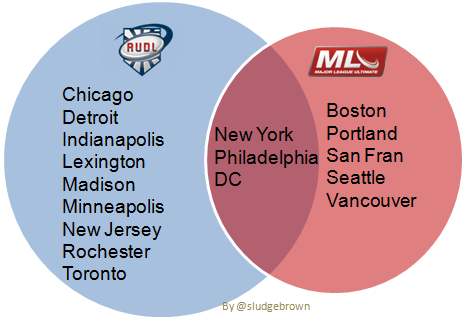 Each MLU conference (Eastern & Western) intended to have 5 teams. Instead, the 2013 schedule will have 8 teams playing games within their conference over 10 weeks. Nixing 2 teams from the MLU team roster reduces league total investment shares by $250,000. Excluding the New Jersey Founders as an MLU founding team is paradoxical. The rationale for "dropping" NJ & SJ teams was because these cities were not deemed as a "strong market", and their proximity to other conference teams were "a bit close together". Sound familiar? (Territory License Agreement & its outcome on the AUDL). In other news, the Boston Bootleggers re-branded to become the Boston Whitecaps. See my suggested names for MLU teams. 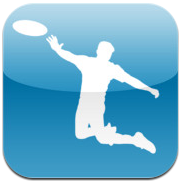 Now that you have Ultimate Championships & the Ultimate Frisbee Whiteboard apps, here's another app to add to your iPhone. 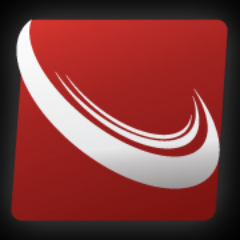 Info: iUltimate is an iPhone app and web site for tracking statistics for your ultimate team(s). Users gather stats during the game and then upload the statistics to their team website (provided). The app also features a Twitter interface that allows the user to "auto-tweet" game events as they happen. •Create one or more teams that can be uploaded and downloaded to different iPhones (for backup or passing on the tracking duties...or a low battery situation). •Upload a game to your team site (each team you create get it's own statistics website) after the game. •Publish game scores real-time to Leaguevine automatically. That Cha-Ching heard 'round the Ultimate world yesterday was AUDL's announcement they plan to offer cash prizes for winners of the leagues championships & the finals. The American Ultimate Disc League (AUDL) announced that it will provide a total $25,000 cash prize to the players winning the 2013 Conference Finals and Championship Game. The winning teams in the Eastern and Midwest Conferences will each win $5,000 and the AUDL Championship team will be awarded an additional $15,000 bringing the total championship team prize to $20,000. 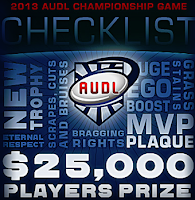 The AUDL Championship game will be played on August 3rd, 2013. So, for AUDL's 2013 championship team with a 25 player roster, this would net them $200/player for winning the Championship game, plus $600/player for the Finals win; $800 in total winnings per professional AUDL Ultimate player. Factoring inflation, AUDL's $25k is nearly equivalent to the $15k guaranteed prize money in the early 90's CUERVO Ultimate Championships. 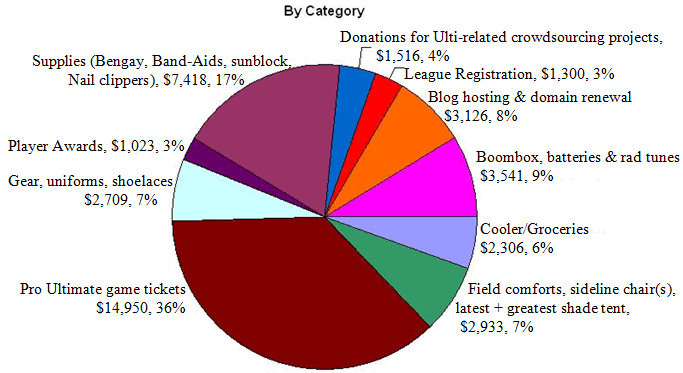 After reviewing San Francisco Revolver's annual costs "Costs, Costs, Costs (A reality check)"(~$1600/Ulti player), I decided to post the expenses for Sludge's complex budget. To my surprise, Sludge apparently operates within the same total annual operating budget as an elite men's club team differing in a few categories. This year's budget (see below) completely defunded the 'Drawstring Replacement for Ultimate shorts' project, and nixed the documentary about our Ultimate season. How does your team's budget compare? 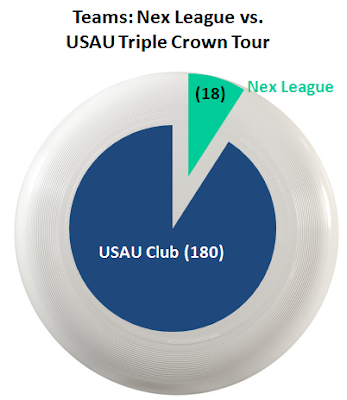 With the recent announcement of NexGen confirming all 18 of the invited club teams to its Nex league, this leaves USAU's Triple Crown Tour, well, with still plenty of teams to play in its new club structure in 2013. DISCLAIMER: It's NOT official that Nex-committed teams are leaving USA Ultimate. So, take away 18 teams from the 198 total = 180 USAU TCT remaining men's teams. (NOTE, 1 team from the Top-16 was not invited to the Nex League.) 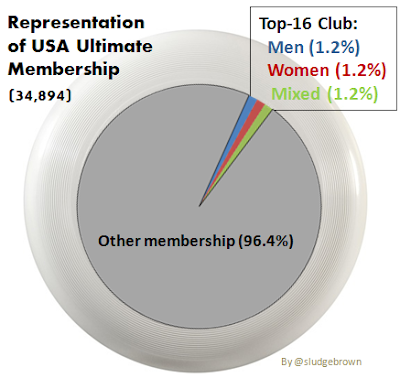 If teams were to completely jump from USAU, that would be a loss of only 9% - albeit the corps d'elite - but there are plenty of fish in the Ultimate Club scene. The 2012-dated MLU Rulebook for the 2013 season was posted on Sunday night. 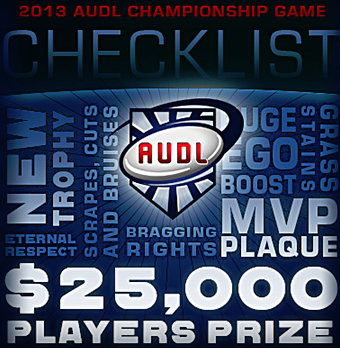 The 32-page document is similar to AUDL's rules, and speaks to what is commonly known as "Spirit of the Game". One notable addition is what happens to players who commit a flagrant foul. Somewhat like soccer's penalty card system (yellow, red), orange band(s) are used to signify who has been naughty. 1. Only active players may earn a band. 2. If a player earns a flagrant foul for any excessively physical action that potentially endangers another player, the official may decide to award that player with a band as an extra penalty. 3. The player must walk up to the official and receive and wear the bright orange band. 4. The band must be worn on the upper arm, over any other clothing, and must be clearly visible any time that player is on the field. 5. If the player intentionally removes, hides, or conceals the band while he is on the field, he is ejected. 6. If the band falls off in the course of play, he will retrieve it and put it back on during the next clock stoppage. 7. If a player earns two bands in the same game, he is immediately ejected. 8. For every three bands a player earns per season, he is suspended for the next game, in addition to any games he was ejected from. As the Triple Crown Tour and Nex League configuration continues to play on, let's understand the guiding principle of each as they pursue showcasing the best of elite Ultimate. "To advance the sport of Ultimate in the United States by enhancing and promoting Character, Community, and Competition." "I do what I do because I'm passionate about increasing access to elite ultimate." Now, who does this directive cover? 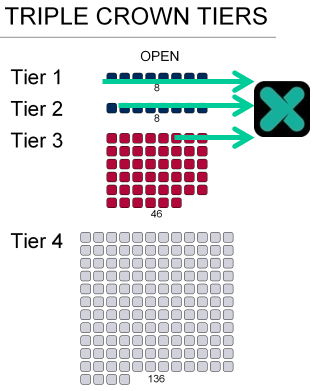 Triple Crown Tour = Tiers 1 (8) + 2 (8) + 3 (46) + 4 (136). 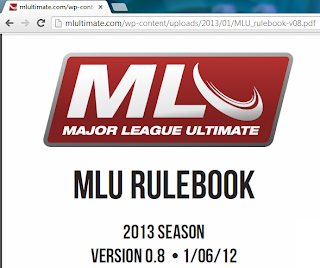 Major League Ultimate's released a draft of the rulebook for their 2013 season. "Spirit of Sportsmanship" is MLU's version of AUDL's "Integrity Rule" which emulate USA Ultimate's "Spirit of the Game". a. Any player on the field of play or head coach has the ability to overturn a call specified in the section below made by the official. b. Officials will respect the call made and overturn the original call immediately, as the intention is to display sportsmanship and remedy an incorrect call against the opponent if the team chooses to do so. c. This rule applies only to calls made by an official and not to non-call situations. a. The officials understand that the Spirit of Sportsmanship is the most important aspect of this rule. The intention here is not to devalue the call of the official, rather to increase the value that the MLU holds on getting the call correct and holding their players to the highest level of integrity in the world of sports. b. The integrity rule is signaled by a player holding their left arm straight in the air and patting their heart with their right hand. The player must also verbally attract the attention of an official. c. The integrity rule is signaled by the head coach by patting their heart with their right hand. The coach must also verbally attract the attention of the nearest official. d. An official must acknowledge a properly made call by a player or coach and may not overrule this call. An official acknowledges the call by blowing the whistle three times and raising his left arm straight above his head and patting his heart with his right hand. e. When the rule is enacted, the play and the clock are stopped and must be resumed by the official. Ultimate Teams, Cities, and Pro Leagues! Oh My! A compilation of Ultimate teams/locations who are in one, some, or all of the 2013 professional Ulti leagues. Proof you can get lots of air in your layouts. Hang gliding never looked so appealing! 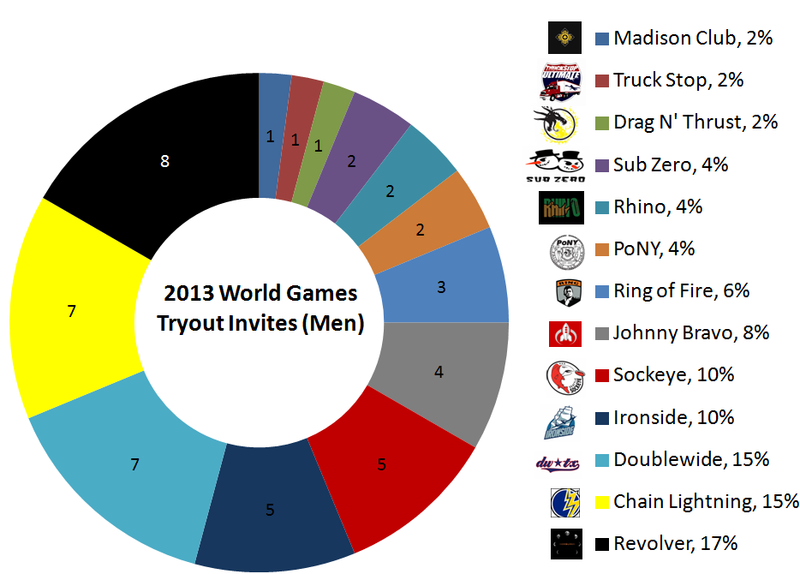 USA Ultimate announced the players selected for the 2013 World Games tryout camps. 500+ players from across the United States applied and 48 men & 42 women were chosen by the selection committee. Players will tryout in March for the 20-player mixed team roster scheduled to compete at 2013 World Games in Cali, Colombia in July 2013. The 2009 roster had 11 men; 9 women. 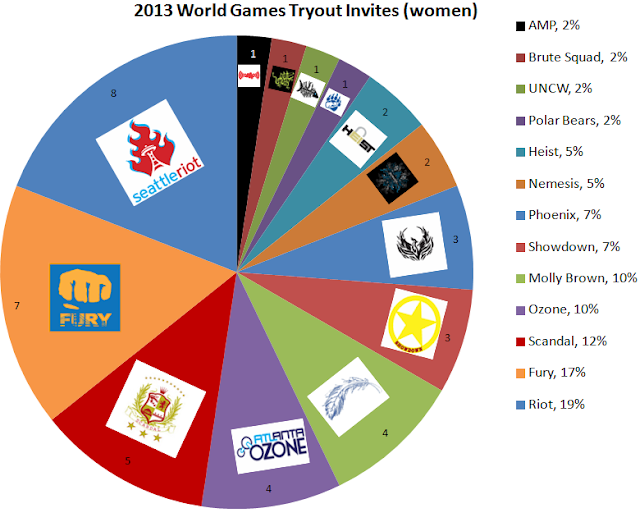 NOTES: Seattle Riot, San Fran Fury & DC Scandal = nearly half (48%; 20) of the women invites. 13 total teams are represented; 12 men's club teams plus 1 mixed club team (Drag N' Thrust). Chicago Machine is the only team USAU Top 10-ranked team without an invite. NexGen's proposed elite club Ultimate league announced they have commitments from half of the invited teams. Projections are based on the USA Ultimate flight selection and vicinity to other elite ultimate teams. 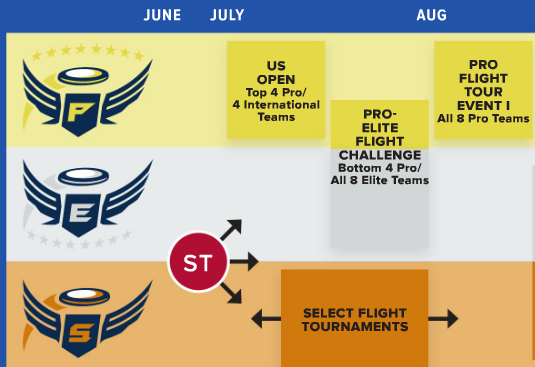 Primarily, Elite flight teams would want to seek out a better competition system than the USAU-offered Triple Crown Tour, regardless of their players' MLU/AUDL ambitions. Thanks to my Ulti Cleats. Both MLU & AUDL teams play here. Have a happy & healthy New Year - 2013!